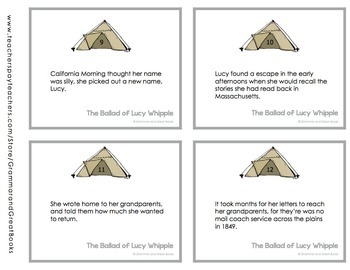 This set of 48 Task Cards will help you assess students' ability to identify and correct run-ons, use coordinating conjunctions properly, use commas properly, identify misspelled homophones, use parallel verb tense, and more, all while reviewing this exceptional work of historical fiction. 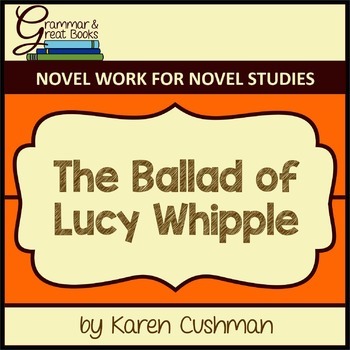 The Ballad of Lucy Whipple by Karen Cushman tells the story of a young girl who unwillingly accompanies her family to California during the Gold Rush. Teaching grammar through a great read makes better use of your class time. 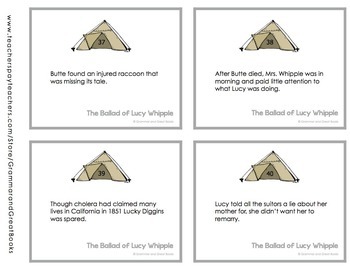 • Use after a Read Aloud or as you Read Aloud. The DLR cards are chronologically ordered so that you can review the contents of the previous chapter and grammar at the same time. • Display in a pocket chart. Students record answers on the Student Worksheet. • Use with students at a higher reading level who are fast finishers. 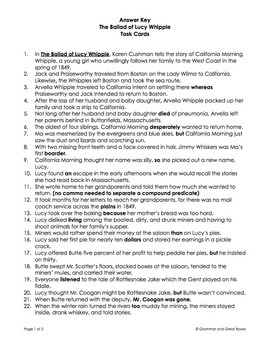 • Use for group work in Literature Circles. • Send home as flashcards on a ring for students to work on with their parents. Download the free preview to take a closer look at this unique product. •	then check out By the Great Horn Spoon: CCSS-Aligned Novel Work. •	then follow me. Look for the green star at the top and to the right on this page and click it to become a follower. The star is next to my store name: Grammar and Great Books. When I add a new product, you will receive an e-mail with a link to its description. If you choose not to receive e-mails, simply go to My TpT and click on My Favorite Sellers. This is a list of the sellers you are following. You can turn off notification (from green to red).